Sometimes all it takes is a fresh set of eyes to see a town or situation in a completely different light. When the Old Orchard Beach Town Council hired Mark Pearson as their new town manager that is exactly what they got. Pearson, a native of Massachusetts and a Marine CORPS Corp. veteran, had worked for the Salem Police Department for over 26 years. He retired in 2007 with the rank of SM “C” Captain and was responsible for many of the administrative functions within the department. I changed the culture of the department for the years that I was there,” Pearson said. “We did police driver training for the first time in 22 years,” he said as he slowly and methodically listed many of his accomplishments in Salem. 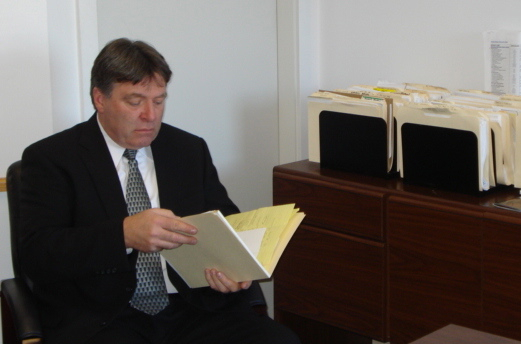 During his time in Salem, Pearson also attended Massachusetts School of Law on a part-time basis and graduated in 1996 with a degree in Public Sector and Labor Law. In 2007 Pearson retired from the Salem Police Department and started to think about what he would do next with his life. He ran for the New Hampshire legislature and was elected to serve two terms. During those years, he heard that there was position open in Hudson, N.H. for an assistant town administrator. “I applied, went through the hiring process, and got the job,” he said. For three years he worked in Hudson, modernizing their systems and improving the code enforcement policies and procedures. “We digitized all of the documents for the town and now all of those particular forms and permits can be accessed on the computer,” he said. Pearson spent three years in Hudson before hearing about two open positions in Maine. He went through the interview process, spoke with town councilors and the former town manager, Jack Turcotte and, in the end, the town council hired him. Pearson has a six-month probationary contract and, if he is kept on after that, he will work under a two-year contract for which he will be paid $89,400 per year. Pearson has not worked alone as he assumed the role of town manager. Turcotte, his predecessor, worked with him to understand the projects that were underway and to help him better understand the different departments that would be reporting to him. “He has been a great help to me and an asset to the town,” Pearson said. In the short time he has been on the job, Pearson has become aware of the pressure from the both the people in the town and the council. “They expect a lot, but it is my job to move forward and accomplish some of these projects,” he said as he pointed to many folders and documents lining his desk. Pearson is used to this type of work and he knows he will also have to address budget concerns. In the past, Pearson has made a name for himself by streamlining the way a town or city delivers those services. He hopes to do the same in Old Orchard Beach and, with this job, he knows he won’t have to worry about people wondering if he is connected politically. “I know that I am disconnected from Old Orchard Beach,” he said.